Philips HeartStart OnSite AED is designed for the ordinary person in the extraordinary moment. It is easy to set-up and includes automatic Life Guidance features like voice prompts & CPR coaching to help guide you through the treatment of sudden cardiac arrest. 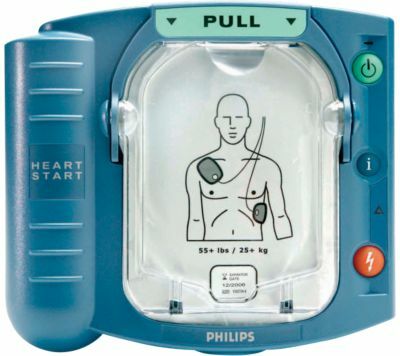 Considered one of the most easy to use external defibrillators, this lightweight (3.3 lbs) defibrillator turns on with an easy-to-use pull handle, or a green button. The Philips Heartstart Onsite is one of the most versatile defibrillator devices that is available on the market without a prescription. It turns on with an easy-to-use pull handle, or a green button. With its Quick Shock technology, it is among the fastest in class at delivering a shock after CPR. Studies show that minimizing time to shock after CPR may improve survival. Pediatric Friendly. With optional pediatric pads, it can be used for the pediatric victims of sudden cardiac arrest. Philips AED’s come with an 8 year manufacture’s warranty. Think that the Philips HeartStart OnSite AED is the one for you?